I know you all are going a little crazy trying to find the hottest Back-to-School trend in the endless racks of clothing at your local department store, so I'm going to help with a little of the stress (or possibly add to it HaHa) by giving you a top ten list for Back-to School. 2. High waisted is still in. 6. Same hue from head to toe. Try wearing different tones and shades or a bright with a more muted version so that you will not feel over whelmed by the color. Here is an extreme version by A. F. Vandevorst Fall 2010 that I love. 7. Gold in unexpected places. These tights by Just Cavalli Fall 2010 are amazing! 8. Menswear inspired, tailored looks. Try wearing a Menswear inspired blazer with jeans and booties or match it with some funky tights and comfy, flats. 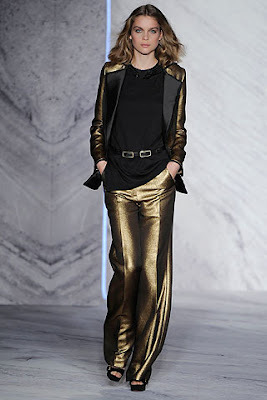 Here's a pic from 3.1 Phillip Lim Fall 2010; this look is three trends in one... #2 High waisted belts, #7 unexpected gold, and #8 Menswear inspired. 9. Not your typical hoodie. Try getting a hoodie that proclaims "I love being the one and only ME!" 10. For the little traveler in all of us... Nomadic is now! 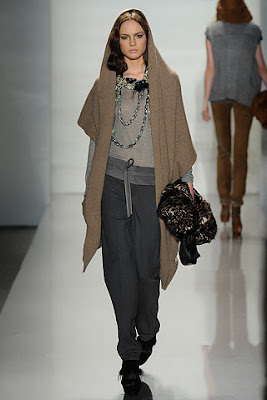 This look from Elie Tahari Fall 2010, beautifully brings together trends #9 and #10.